resists antibiotics. 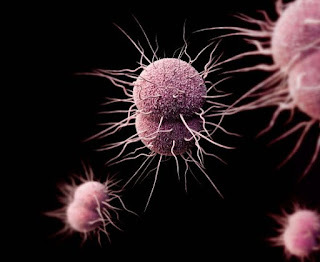 (Centers for Disease Control and Prevention photo)"Health officials are tracking record-breaking rates of sexually transmitted disease, including a resurgence of some infections which had been considered rare, such as gonorrhea and syphilis. These STDs are on the rise amid cuts to public health budgets dedicated to testing, prevention, and public outreach," Mary Meehan reports for Ohio Valley ReSource, which covers Kentucky, Ohio and West Virginia. The Centers for Disease Control and Prevention reported 2.4 million new cases of STDs in 2017; about 40 percent of those were among people aged 15 to 25. In some Ohio Valley communities, chlamydia infections rose more than 200 percent and gonorrhea rose 1,000 percent or more between 2011 and 2017, Meehan reports. The surge among younger people could stem from a greater likelihood to engage in risky sexual behavior. Jim Thacker, spokesperson for the Madison County Health Department, told Meehan that people born after the AIDS epidemic was largely contained may be less fearful about STDs. And the availability of effective, long-term birth control might make young adults and teens less prone to use condoms, he said.